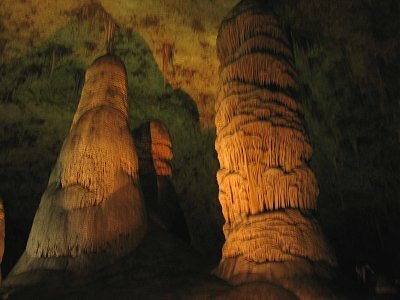 The Carlsbad Caverns are an extensive cave system with over 80 known caves. It originated 250 million years ago as erosion started on a reef in an (evaporated) inland sea. The park now sees about 400.000 visitors a year. Also, about one million Mexican Free-tailed Bats have made this their home. 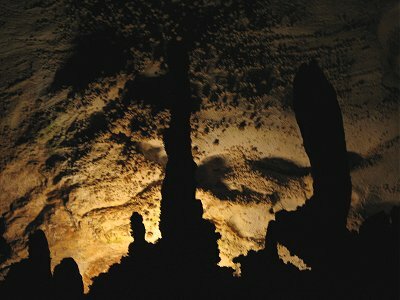 Most notable example of the caves is the Lechuguilla Cave: of spectacular beauty it holds remarkable decorations like helctites forming under water and largest collection of gypsum chandelier speleothems. This cave is closed to the general public. Karst cave systems are widespread in the world, but Carlsbad distinguishes itself because of the huge chambers as well as the abundance and beauty of its decorative mineral features. I travelled to Carlsbad Caverns from just outside El Paso. It's almost a 3 hour drive from there on Highway 180: 155 miles. There are no amenities whatsoever along this quiet road. You do pass the pretty Guadelupe Mountains though, a site on the US Tentative List and a good place for hiking or just having a picknick. After having acquired the admission ticket at the Visitor Center, I entered the caves via the Natural Entrance Route. This is a one-mile trail that follows the traditional explorers' route (dating from the early 1900s), descending more than 750 feet. It's a steep way down in semi-darkness. You can smell the droppings of the bats (but not see them, fortunately for me as I don't like birds or other flying subjects fluttering around my head). I thought this trail was a nice morning walk, but don't expect to see any spectacular mineral features en route. That all changes when you enter the Big Room. It's the cave at the end of the Natural Entrance route, but it can also be accessed via an escalator from the Visitor Center. Big it is indeed: it takes at least an hour to make the full circle walk. It's like a sightseeing tour across fairy land. 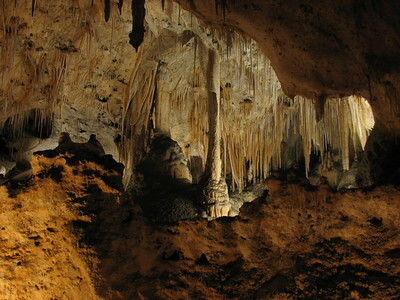 Stalactites, stalagmites, but also 'Soda straws' (very thin, hollow stalactites with water dripping through it), draperies, columns and other forms. The scarce lighting of course also adds up to the mysterious atmosphere (what if caves like this had full lighting?). In all I spent about 2,5 hours underground and enjoyed especially the diverse formations in the Big Room. I have seen other caves around the world that feature dripping stone, and you have to see this phenomenon once in your life I think. Carlsbad Caverns probably has the biggest collection and so is a good place to visit. This is the situation we found ourselves in as we entered Carlsbad Caverns National Park. Yes, we could explore the park, access all road and trails unimpeded, but the famous caverns which make this site exceptional were shuttered and not accessible to the public. Considering, we had already drove the 14 hours from Los Angeles, there was no turning back at this point, and we were determined to make the best of the situation. 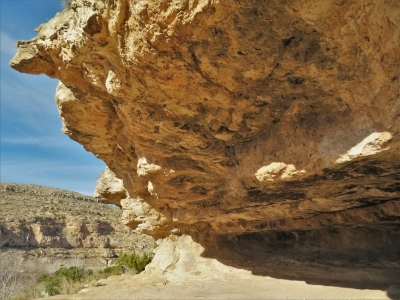 Carlsbad Caverns like its southern counterpart Guadalupe Mountains National Park are located in the Chihuahuan Desert. From the National Park website it states, "High ancient sea ledges, deep rocky canyons, flowering cactus, and desert wildlife—treasures above the ground in the Chihuahuan Desert." Previous visitors (rightfully) occupied with the wonders below-ground might be unaware that there is a 9-mile dirt road called Walnut Canyon Desert Drive, which introduces you to the parks wilderness. Rattlesnake Canyon Trail offers some excellent views and an opportunity to see limestone ledges that harken back to the parks past as an inland sea. Furthermore, there are plenty of cacti species as you traverse a small canyon/wash. We made sure to hike as many trails (however small), since we had about 4-5 hours to explore the park. We saw plenty of deer and jackrabbits throughout the park. Moreover, there were several outdoor "exhibit area" stops along the main park road (paved) that included panels that either describe some of the biodiversity of the Chihuahuan Desert or informed visitors about the ancient indigenous peoples who lived here. Eventually, we made our way to the main cavern entrance (Big Room). The view only reminded us of what could have been. We had in fact, reserved a tour using recreation.gov well beforehand to make sure we could enjoy the King's Palace Tour. While we left disappointed, we did make the best out of the circumstances. The desert environment while interesting, is not outstanding when compared to the Sonoran Desert in Arizona and the already inscribed Gran Desierto de Altar National Biosphere Reserve. I hope to visit and tour these amazing caverns one day in the future, but sadly it won't be anytime soon. When I reached the big room of Carlsbad Caverns National Park, my jaw dropped immediately after saw this subterranean wonderland. 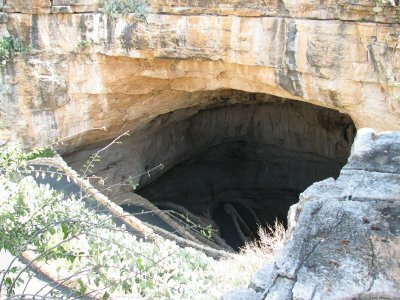 After visited many great World Heritage Site caves, visiting Carlsbad was still quite interesting for me. There are two things that really shrined out from this site. The first thing is the exceptionally good management. The cave is very convenient and easily accessible to reach by elevator from visitor centre, good pathways and lovely underground toilet! Carlsbad Caverns is probably the best cave I have seen in terms of tourist facilities; also the light display did very good job, not too bright and able to highlight the unique feature of those dripstones. The second is the stalactites and stalagmites inside the cave. The size and types of these geological wonders are truly impressive. I never saw many gigantic stalagmites like the ones in the Hall of the Giants. The ceiling is also really full of stalactites like very big yogi's bed, an unbelievable sight. The small chamber called Dolls Theatre is really fantastic; the huge amount of stalactites reminded me the beautiful foyer of wisterias. The crystal spring dome is another favourite, the white rock the always has water comes out, very mysterious and I felt like I saw the source of life directly from Mother Nature. There are many interesting features inside the cave, although most of rock formations I already have seen before in many UNESCO listed caves, but the superlative size of stalactites and stalagmites of Carlsbad Cavern are unbelievable, and seem that almost all types and styles of dripstones could be seen in only one place which is truly amazing. In my opinion, Carlsbad Cavern is a really great World Heritage Site, one of the best representations of limestone chamber and dripstone wonders, highly recommended to visit this subterranean wonders in the corner of New Mexico. I went to the cavern during my summer vacation. my aunt in lovington, nm, took us to see the caverns. i didnt expect the caverns to be so huge and beautiful. the price was really worth the pay. 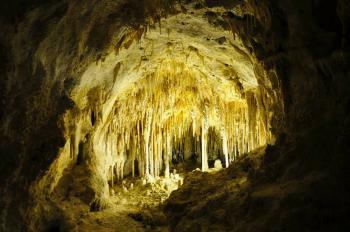 the caverns are a really delicate beauty that should really be experienced and visited if your ever to pass by carlsbad. i would defenetly rate it a ten on my rating list. i want to thank the staff for making my vacation a very exciting and thrilling one. i am certain to be back. We spent the night in Roswell, which is about an hour up the road. The drive into the park looked spectacular and cactus-covered, but unfortunately we couldn’t stop at any of the views. At the park we rushed in to buy the King’s Palace tour tickets and took the elevator down into the caverns. They have a small area inside the caves with food (including great hamburgers) and gifts. The King’s Palace tour was beautiful and the hike up the hill was horribly overrated. The tour concludes before you hike up, so you can take your own pace. The Big Room tour was also fabulous and you can easily spend an hour and a half doing it. The only disappointment was the Bottomless Pit which was a different view than I thought it would be. We were going to hike out via the Natural Entrance, but apparently you have to enter before 12. Make sure you hike in in the morning if at all possible, since we missed all the bats because we couldn’t spend the night. The plaque was on the outside wall of the visitor center near the door (the last place I looked). The parking lot is also over a sudden drop and a beautiful view of the landscape. Carlsbad Caverns is so staggering in its scale & enormity. Big Room. Then walking around the Big Room took an hour. The bat flight at dusk was something very surreal. It was like watching a Halloween movie unfold before you. anybody to see this treasure. When I was 12, my family took a long tour throughout the American Southwest. Carlsbad Caverns is the site that sticks out in my memory, even more prominently than the Grand Canyon or Zion National Park. It really is a subterranean fantasyland. I have visited a number of caverns in the US already, and its a good thing I saw them before Carlsbad, because NOTHING can compare to the size and the variety of formations found here. I'm afraid all other caverns would look dull after seeing Carlsbad Caverns. I took two of the pay tours and they were fantastic as well and worth the money. Take three days or so to do this if you have a family because you will get tired. If you want, take the elevator up from the Bog Room, but if you are able take the natuarl entrance down. You won't be sorry. The area around Carlsbad is lacking a little. The map shows Lincoln Forest not to far away. - Don't Bother - Its not exactly a forest, and the waterfall is more of a trickle. If you enjoy desert scarceness, you will like it, but if you are looking for a real waterfall, keep going. I toured the caverns on September 3rd. I took the natural entrance route and the Big Room tour, then came back up on the elevator which penetrates through 750 feet of solid rock back up to the visitor center. I then came back in the evening to watch the bats on their daily exodus in search of dinner. The Chihuahuan Desert is alive with birds, insects and other creatures and is quite scenic to take in this time of year, with all the flowers in bloom. Instead of staying in the motel near the park entrance, I opted for a much cheaper room 20 miles up the road in the town of Carlsbad. The next day I went hiking in Guadalupe Mountains National Park, about an hour south of the caves. Middle Pleistocene: The decoration of Carlsbad Cavern with stalactites, stalagmites and an incredible variety of other formations began more than 500,000 years ago after much of the cavern had been carved out.